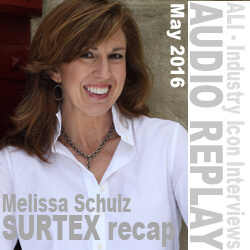 IF YOU WERE NOT ABLE TO ATTEND SURTEX 2016, OR JUST WANT THE LATEST IN TRENDS IN ART LICENSING, PURCHASE MELISSA’S RECAP NOW! For the past six years, Tara Reed and Paul Brent have brought you a summary and review of each of the past SURTEX shows, including trends and industry updates. This year, they have passed the torch, so we are blessed with the 2016 Report being given my our own Melissa Schulz! Having spent multiple years as a leader in the world of consumer products, and over 20 years in the licensing industry, Melissa is a devoted follower of the latest and greatest in our industry; making her the ideal person to offer this year’s observations! Color Coordination! – both from observation and a review of the exciting color and design presentation by Pantone Color Institute’s Leatrice Eisman. Iconography Observations! – what was showing up at both SURTEX and the National Stationery Show, and what wasn’t! Process Performance! – was letterpress still the hot trend for 2016, and what was starting to emerge. Is there a trend towards a decrease in royalty rates? ALL OF THIS INFORMATION AND MORE . . . FOR ONLY $30! CLICK HERE to receive your download today! Thank you for the download. I hope to learn more about art licensing. Your welcome Eddie! Thanks for joining us!